Did you know Greater Comfort has been serving all of Northern Kentucky, Greater Cincinnati and Southeastern Indiana for nearly 30 years? In fact, more than 25,000 families and businesses have trusted us to help them with all their HVAC needs. That’s part of why the Greater Comfort team is glad to be involved in our local community. Looking ahead to the Campbell Cup and the Bluegrass Games—two local soccer tournaments which we’re helping to sponsor—we thought it would be a great time to look at some of the fast facts on soccer here in Northern Kentucky and Cincinnati. FC Cincinnati, our brand new, fast-growing local soccer team, is a United Soccer League (USL) club that began play just last year, in 2016. With much success and popularity in its first season, this season so far has been just as popular. In April 15, at the team’s first home game, the team set a record for a home opening game with 23,144 people in attendance at Nippert Stadium. It’s not surprising, then, that FC Cincinnati has been grabbing national attention, and the attendance consistently rivals that of MLS teams in large cities. Last year, we started to hear rumors of how the club is in fact pursuing becoming an MLS franchise. When the MLS Commissioner, Don Garber, came to town, large crowds showed up to welcome him. He went on a mini-tour of the city, making stops at Nippert to see the current facilities, but also going to downtown and the OTR area. Heavily covered throughout social media by fans in the community, the trip also included a Town Hall meeting. It’s hard to know what the future holds since many other cities are also being considered, but it’s exciting for Northern Kentucky and Cincinnati soccer fans. For years people have wondered why we didn’t have a local, successful, sustainable professional soccer team, and part of the reason why was because the Cincinnati and Northern Kentucky competitive soccer landscape is…well, so competitive! High school soccer is just as competitive in the area, with many private and public state championships in both Kentucky and Ohio coming from the area. With all these families being engaged with and connected to soccer, Cincinnati is also home to three other professional soccer teams. As of right now, we have two outdoor teams, the Cincinnati Kings and Cincinnati LadyHawks, and one indoor team, the Cincinnati Excite. We’re proud to be sponsoring an activity that is so popular in the area and is helping our families get outside and have fun in the process. 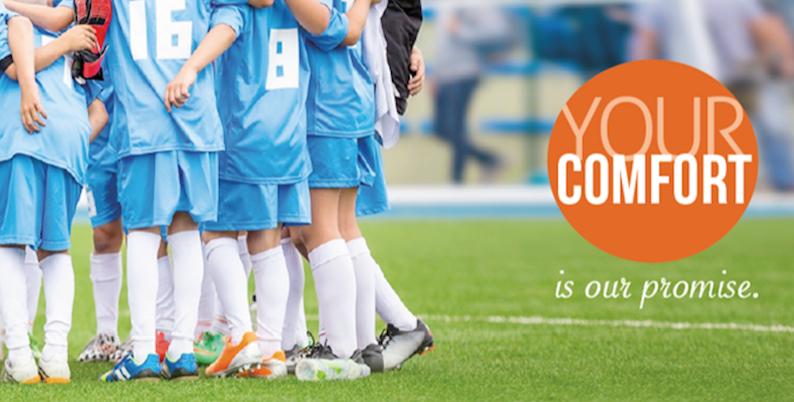 Good luck to all the teams participating in soccer tournaments this spring and summer, including the Campbell Cup and the Bluegrass Games! We’re proud to be supporting our local community, both keeping you comfortable at home, but also supporting you out on the field. Greater Comfort is here to make your home as comfortable as possible. Offering competitive rates and service from factory-trained heating and air conditioning technicians, you can rest assured that you are getting high quality service every time you call us. We are an authorized dealer of some of the most trusted brands in our industry to match your homes heating and cooling needs. Contact us today at 859-491-4915 to schedule service or to setup an estimate.